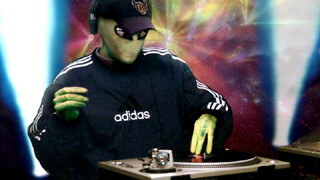 Dose the Alien has been a pioneer in the music of underground cultures. Starting out in the Industrial movement in 1989 and crossing over into the rave scene in 1993, his music and artistic visions keep turning out track after quality track. His live performance established him as headlining talent in major markets across North America and by 1995 he was headlining major events along side such legends as Frankie Bones, Anthony Acid, Nostrum, Dieselboy, and Charles Feelgood. By 1997 the release of his first 12" single, "the bubble ep" and his first full length LP "Archaeology" was released on Utopiate Recordings, and was followed by releases on Frenzy Records, Tangent Recordings & Protium Recordings. By 1999 he had quickly established himself as one of the most sought after trance DJs headlining events in such cities as Denver, Toronto, San Francisco, Seattle, Indianapolis, Buffalo, Montreal, Ottawa and New York City. The Year 2000 saw the "Inner Space Tour", a 12 city North American Tour with Geophone Recording artist Mike Parker. Current studio projects in the works include working with Thomas Penton, whose "Cliffhanger" release on the UK's Tune Inn label spent 2 weeks on top of the Balance Charts. Breaking a long 5-year silence, since his last live performance in 1997, In October of 2000, he performed live to a crowd of over 1200 with Dream Research's Nathan Cipher as "Planetarium".